Movie buffs in particular will enjoy a visit to the little village of Tabernas, about 16 miles (26km) from Almeria city, set between the Sierra de Alhamilla and Sierra de Filabres in a barren landscape of canyons and rocky wasteland reminiscent of the American Wild West. A few decades ago, when Western movies were the most popular Hollywood genre, legendary stars such as Clint Eastwood, Lee van Cleef, Claudia Cardinale and Charles Bronson strutted their stuff here in the dry heat on film sets which fans will recognise from movies such as The Good, The Bad and The Ugly, A Fistful of Dollars and The Magnificent Seven. The movie lots have now become theme park tourist attractions. 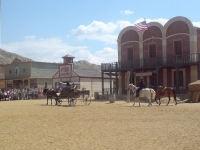 There are three to visit: Mini Hollywood, Texas Hollywood and Western Leone. All offer a fun day out in Europe's only desert region, with stagecoach rides, live shows, a zoo and the opportunity to quench your thirst in the saloon. Tabernas is the name of the desert itself, with the barren, eroded landscapes typical of the badlands from cowboy movies, and those who want to experience the real thing, instead of playing at it on the movie sets, can organise horseback treks into the desert.